The reeling Cardinals lost four of six at home to losing teams from San Diego and Tampa Bay this week, extending their skid to 4-9 since the eight-game win streak. A road trip to Milwaukee and the West Coast is ahead. Yadier Molina has quietly continued to perform well at the plate. Cardinals Hall of Fame inductee Pepper Martin is profiled in our history feature. St. Louis dropped the first of a three game home series to the Padres in large fashion. The lead changed several times during the first six innings, but the Cardinals bullpen had a major meltdown in the final innings. Starter Lance Lynn pitched six innings, giving up four runs on six hits. The right hander struck out four and walked one. Reliever Matt Bowman started the seventh, but left with three more Padres’ runs on the board and no outs. Zach Duke then replaced Bowman and allowed three more runs, for six runs in the inning, before getting the three outs to end the inning. Josh Lucas tossed the final two innings and surrendered two additional runs in those two innings. Bowman took the loss. All four Cardinals runs came via the home run. Jedd Gyorko hit a two run shot in the fourth, and Stephen Piscotty followed with a bases-empty homer. In the sixth, Yadier Molina hit a solo shot. Molina was 2-for-2 with two runs scored. Piscotty was 2-for-3. The Cardinals fared better in Game 2, thanks to a pitching gem by Luke Weaver. The rookie pitched seven scoreless innings, allowing three hits while fanning 10 and walking one. Seung-Hwan Oh relieved in the eighth, gave up one run, and left with no outs on the board. Tyler Lyons finished the inning with no further damage. John Brebbia pitched the ninth and surrendered a solo home run. Weaver was the winning pitcher, his second. Tommy Pham got the Cardinals on the board in the first inning with an RBI double to left. Dexter Fowler also drove in a run in the inning on a sac fly. In the third, Jedd Gyorko singled to bring a third run home. Greg Garcia scored in the fourth on a throwing error on a pickoff attempt. In the fifth, Fowler scored on a wild pitch. The final Cardinal run came home on Gyorko’s RBI single in the eighth. Kolten Wong was 3-for-5 with three runs scored. Gyorko was 2-for-4. On the base paths, Wong stole both second and third base, but has just six stolen bases on the season. Pham stole his 17th base. The Cardinals were edged by the Padres in the rubber game of the series. The offense had 12 hits, but only scored three runs. The scoring began in the fourth on Jedd Gyorko’s RBI double to left. In the sixth, Yadier Molina plated a run on a ground ball single to left. Randal Grichuk’s solo home in the ninth was the third and final Cardinals run. Kolten Wong was 2-for-5, while Paul DeJong and Dexter Fowler were both 3-for-4. Starting pitcher Carlos Martinez pitched seven innings, giving up two runs, one earned, on seven hits. The right hander struck out six and walked two. Tyler Lyons pitched a scoreless eighth. It took four Cardinal relievers to get out of the ninth. Sam Tuivailala, who took the loss, surrendered two runs on two hits, and left with no outs in the inning. Zach Duke pitched to one batter and allowed a hit. Matt Bowman walked a batter but managed to get one out before leaving for Brett Cecil. Cecil got the last two outs of the inning via the strikeout. Martinez committed a throwing error. In a weekend series against the Tampa Bay Rays, the Cardinals dropped the first game by a score of 7-3. Starter Michael Wacha didn’t get out of the fourth inning, pitching 3 1/3 innings and giving up five runs on nine hits. The right hander fanned five and walked two and was tagged with this seventh loss of the season. Zach Duke got the final two outs of the fourth. Reliever Ryan Sherriff made his major league debut, pitching three scoreless innings, allowing two hits, striking out four and walking one. Sam Tuivailala tossed a scoreless eighth. In the ninth, Brett Cecil surrendered two runs on three hits. The Cardinals put one run on the board in the first inning on a sac fly by Dexter Fowler. 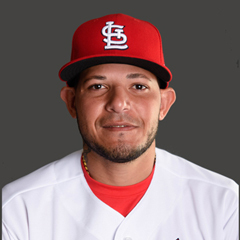 In the third, a sac fly double play off the bat of Yadier Molina plated one. Kolten Wong’s solo home run in the fourth was his third home run of the season. No Cardinals batter had multiple hits. The Cardinals won a nail biter in the second game of the weekend series. The offense was kept off the board until the sixth inning, when two scored on Paul DeJong’s triple and Yadier Molina’s double. The Cardinals tied the score in the eighth on RBI singles by Molina and Kolten Wong. In the bottom of the ninth, Tommy Pham became the hero, hitting a two run blast in a walk off win for the Redbirds. The home run was Pham’s only hit, but he scored three of the six total runs. Molina was 2-for-4 and Jedd Gyorko was 2-for-3. Starter Mike Leake pitched seven innings, giving up four runs on six hits. Leake struck out three and issued no walks. John Brebbia and Tyler Lyons each tossed a scoreless inning of relief, with Lyons earning the win, his second. In the rubber game of the series, St. Louis tied the score in the later innings, but lost in the 10th. All five runs scored via solo homers. The Cardinals were stymied by the pitching of Rays starter Chris Archer, but Kolten Wong final broke through in the seventh with a solo home run. Matt Carpenter tied it up the next frame with his own solo shot. Greg Garcia was 3-for-4. Starter Lance Lynn pitched seven innings, giving up two runs on six hits, including two long balls. The right hander struck out eight and issued two free passes. Seung-Hwan Oh, Zach Duke and John Brebbia each got one out in the eighth. Brebbia returned to pitch a scoreless ninth. Sam Tuivailala gave up the winning run on another solo blast in the 10th and took the loss, his third. The Cardinals ended the week 2-4, having lost both home series to the below-.500 Padres and Rays. The losses put the Cardinals themselves back to .500. St. Louis remains 4.5 games back of the Cubs with 32 games left in the regular season. Cardinal pitching has fallen off, both starting pitching and the bullpen. Mike Leake continues to struggle and Michael Wacha’s last three starts were each shorter than the one prior. Carlos Martinez has struggled off and on since the All-Star Break, especially in the first inning. Most of the bullpen has struggled, with the exception of Tyler Lyons and John Brebbia. Luke Weaver has pitched well since coming up to replace the injured Adam Wainwright, and the Cardinals are searching for a closer with the loss of Trevor Rosenthal for the season. The offense has been inconsistent. Defense has been adequate, but the loss of Jedd Gyorko to the disabled list could cause the defense to take a hit. The Cardinals begin a road trip this week, playing the second place Brewers for two games. The Cardinals play the struggling Giants and the Padres again. Yadier Molina is batting .429 with an OPS of 1.173. He has 1 HR, 3 doubles, and 5 RBI. Jedd Gyorko is batting .364 with an OPS of 1.167. He has 2 HRs, 2 doubles, and 7 RBI. Stephen Piscotty is batting .333 with an OPS of .955. He has 1 HR and 1 RBI. Kolten Wong is batting .360 with an OPS of .905. He has 1 HR, 1 double, and 3 RBI. Carlos Martinez has an ERA of 1.29 and a WHIP of 1.29. Luke Weaver has an ERA of 0.00 and a WHIP of 0.57. Tyler Lyons has an ERA of 0.00 and a WHIP of 0.67. John Brebbia has an ERA of 3.00 and a WHIP of 0.33. Matt Carpenter is batting .188 and has an OPS of .465. Randal Grichuk is batting .125 with an OPS of .551. Jose Martinez is batting .200 with an OPS of .400 in 5 plate appearances. Mike Leake has an ERA of 9.00 and a WHIP of 1.40. Michael Wacha has an ERA of 13.50 and a WHIP of 3.30. Matt Bowman has an ERA of 81.00 and a WHIP of 12.00. Zach Duke has an ERA of 16.20 and a WHIP of 3.60. Seung-Hwan Oh has an ERA of 9.00 and a WHIP of 2.00. The number 2 hitter has been Tommy Pham for four games and Stephen Piscotty for two games. The number 4 hitter has been Dexter Fowler for five games, and Randal Grichuk for one game. The number 6 hitter has been Jedd Gyorko. The number 7 hitter has been Piscotty for three games, Wong for two games, and Grichuk for one game. The number 8 hitter has been Greg Garcia for two games, Wong for two games, and Grichuk for two games. 8/21 The Cardinals optioned 1B Luke Voit to the Memphis Redbirds. 8/23 The Cardinals transferred RHP Trevor Rosenthal from the 10 day disabled list to the 60 day disabled list. Right posterior elbow irritation. 8/23 The Cardinals optioned RHP Josh Lucas to the Memphis Redbirds. 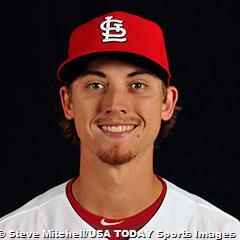 8/23 The Cardinals selected the contract of LHP Ryan Sherriff from the Memphis Redbirds. 8/24 The Cardinals sent LHP Kevin Siegrist on a rehab assignment to the Palm Beach Cardinals. 8/27 The Cardinals placed 3B Jedd Gyorko on the 10 day disabled list. Right hamstring strain. 8/27 The Cardinals recalled 1B Luke Voit from the Memphis Redbirds. RHP Adam Wainwright continues on the DL with a right forearm impingement. Wainwright had a doctor’s appointment on Sunday to learn when he would be cleared to being a throwing program. A possible return to the roster could occur in mid-September. LHP Kevin Siegrist has been sent on a rehab assignment to the Palm Beach Cardinals. It is expected that Siegrist will make at least two more rehab appearances this week in preparation for activation from the DL. RHP Trevor Rosenthal has been transferred from the 10 DL to the 60 day DL. Rosenthal is expected to have Tommy John surgery this week and is out for the remainder of the season and much of the 2018 season. Rosenthal will be a free agent following the 2018 season. 3B Jedd Gyorko has been placed on the 10-day DL with a right hamstring strain. An MRI showed a mild to moderate strain and the Cardinals are optimistic that Gyorko will return to the roster before the end of the season. Matt Carpenter and Dexter Fowler missed games due to a stomach virus. Both have returned to the lineup. On Monday, the team travels to Milwaukee for a short two game series with the Brewers, beginning on Tuesday. Luke Weaver is scheduled to make the Tuesday start, followed by Carlos Martinez on Wednesday. After leaving Milwaukee, the Cardinals head to San Francisco for a four games series against the Giants. Michael Wacha is set to start on Thursday. Mike Leake will make the Friday start. The starters for the remaining two games have not been announced but will likely be Lance Lynn on Saturday, and Luke Weaver on Sunday. On Monday, Sept 4 following the Giants’ series, the Cardinals play four games against the Padres in San Diego. The team returns home on Friday for a weekend series with the Pirates. The Cardinals have another off day on Monday, Sept. 11, but the homestand continues on Tuesday with a three game series against the Reds. On Saturday, the 2017 Cardinals Hall of Fame induction ceremony took place, with three former Cardinals honored. Those players were Tim McCarver and Mark McGwire, voted in by the fans, and Pepper Martin, chosen by the Red Ribbon Committee. Martin was represented by his family at the ceremony, specifically his daughter, who gave the induction speech. To cover all three players in any depth would take pages of this article. I choose to focus this segment on Pepper Martin, of the famous “Gas House Gang”. I have discussed the Gas House Gang in passing several times before, but this segment will cover it more in depth. The Gas House Gang refers specifically to the 1934 St. Louis Cardinals team. That team won 95 games during the regular season, won the National League Pennant, and were the 1934 World Series Champions, defeating the Detroit Tigers in seven games. The nickname was bestowed on that team in reference to their general shabby appearance and rough tactics. The term gas house in those days referred to factories that produced gas for lighting and cooking from coal. Those factories were dirty and smelly, hence the reference to the team, who were reported to have played in dirty and smelly uniforms. 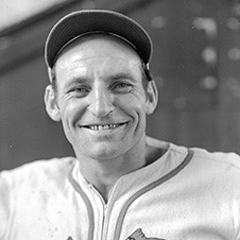 The 1934 Cardinals were managed by Frankie Frisch. Standouts included Joe “Ducky” Medwick, Ripper Collins, the Dean brothers, Dizzy and his brother Paul, and Martin, among others. Martin played for the Cardinals in 1928, 1930-35, and 1944. He was a four time All Star and a three time National League stolen base leader in 1933, 1934, and 1936. Pepper’s full name was John Leonard Roosevelt Martin and he was born on February 29, 1904, in Oklahoma City, leading to his nickname, The Wild Horse of the Osage. Martin’s career batting line over his 13 year major league career was .298/.358/.443 with 59 HR, and 501 RBI. Injuries plagued Martin’s career, and he never lived up to the promise of his early career, when the press claimed him to be the next Ty Cobb. Martin ended his baseball career as a successful manager and coach in both the major and the minor leagues. He was reported to have a fiery temper, and was once fired from his managing job for a minor league team for allegedly choking an umpire. He was once arrested for punching a spectator in the stands. Pepper Martin died of a heart attack on March 5, 1965. His wife, Ruby, survived him by over 40 years, passing away in 2009, just after her 99th birthday. In addition to his induction to the Cardinals Hall of Fame, Martin was also inducted into the Oklahoma Sports Hall of Fame in 1992.